A recent blog claims that, following in the footsteps of Jesus and Francis of Assisi, Pope Francis aims to end religion. "Some scholars," the author points out, "have said that Jesus came to end religion. If you consider how He continuously provoked and criticized the Pharasees and Scribes, this begins to make sense." How loaded would you be if you had a dollar for every time you heard somebody say "I'm not religious, but I'm spiritual"? This modern montra characterizes a culture seeking union with the transcendant apart from the apparently man-made constraints, rules, dogmas, etc. of the old way. Religion is a bad word. John Lennon dared an entire generation to "imagine a world with no religion." The challange was accepted. Aren't we all happier now? All of this legalistic, rigid stuff just gets in the way, right? If we, as Catholics, seek a true, free, and loving union with God, shouldn't we too try to get beyond religion? That depends on what we mean by "religion." Ask a person what the word religion means (ask yourself too). Chances are, you'll come up with something like "a belief system or set of beliefs in God." Chances are, you'll hear the word "organized" in there as well. Even Webster, bless his heart, calls religion "an orginized system of beliefs, ceremonies, or rules used to worship a god or a group of gods." Catholics, that is precisely not what religion is; and it's high time we stop talking in this way. St. Thomas Aquinas offers the Church's definition of religion concisely: religion is the virtue by which God is given His due. Please memorize that, and tell your friends. The cardinal virtue, or good habit of the soul, by which we give others what they are owed is justice. Justice has many sub-virtues because we owe different sorts of things to different sorts of people and entities depending on our state in life. For example, when you give your country what you owe it, you're practicing the virtue of patriotism. When you give teachers what you owe them, you are practicing the virtue of docility. When you give elders your what you owe them, you are practicing the virtue of piety. When our polis gives a criminal what he is owed for his misdeeds, it practices the virtue of revenge. When one under a vow gives his superiors what they are owed, he practices the virtue of obedience, etc. etc.... and when we give God what we owe Him, we practice the virtue of religion. To consider the implications of religion being a virtue according to justice, imagine yourself in a convenience store. You pick out a nice bottle of water and take it to the clerk who tells you, "that will be $1.29." What do you owe the clerk in justice? That's right. You owe him $1.29. Now consider the absurdity in the event you respond by telling him, "Oh, actually, I would rather just pay you ten cents for this bottle of water." Bottled water is over-priced anyway, right? You lay your dime on the counter and smile. You did what you felt like doing. You're a good person. But did you do justice? Certainly not - you failed in justice because you owed $1.29 and did not render it. As a consequence, you will go thirsty, or worse, be a thief. Now consider what you owe God. How much more than $1.29 is our debt to Him for what he has done for us? How can you repay him for loving you (and that water bottle) into existence at this very moment? The truth is, you can't. You can't repay God at all on your own- which is why true religion is only possible through Christ Jesus, God-Man. It's like when you were a kid and you owed your parents a dollar, so they gave you a dollar so you could give it back to them - it's like that but with God's very life. God gives us His life, so that we can offer it back to God, satisfying our debt. (Cf. Liturgy of Chrysostom, "We offer you your own from what is your own.") 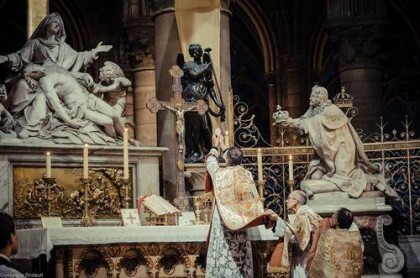 Thus, incorperation into this mystical body being offered to the Father until the end of time, is principally necessary for the virtue of religion. We cannot be religious apart from Christ. As our Lord tells us, "No one comes to the Father except through me." (Jn. 14:6) In this light, the Eucharist is supremely religious - "It is right and just." If religion is indeed a virtue of justice, as the Church has perenially affirmed, then why do we run around as if it's something we humans get to invent and systematize? Indeed, If religion is the giving of God what He is owed, then there can be no such thing as multiple religions at all - only true religion and it's contrary. You can either pay the clerk what you owe him for that bottle of water or pay him what you don't owe him. But only one payment is just. The other options, which you determine, are unjust. The Catholic Church is not one religion among many. As the mystical Body of Christ, united to the Father, in a very real sense, it is the only religion - for it alone offers God His due; Christ alone offers the Father His due. Now it is the case that prior to the reception of the Gospel, throughout the ages, men have striven for just offering to the divine. In this sense, we can speak of natural religion; and the Church is always eager to embrace what is true in these efforts. But the crisis of modernity is not a crisis of paganism - it's one of heresy (from the Greek, hairesis "choice"). As contradistinguished from orthodoxy (right worship), heresy is a personally chosen form of worship. To quote Ross Douthat in an interview with Bill Maher worth watching (warning for Maher's typically crude language), "We live in a nation of heretics." When you hear people proclaiming the gospel of 'to each their own,' 'all rivers lead to the same ocean,' etc., you are hearing people assert that our debt to God can be paid however one feels like paying it; this is the boasting of a heretic, and it is more absurd than one's attempt to offer the store clerk whatever one feels like upon checkout, eating whatever one feels like to get in shape, or paying whatever one feels like to the IRS come tax season. To the fallen man, the demands of justice usually extend beyond the limits of one's good feelings. Religion, as an aspect of justice, is no exception. To be clear, based on the one piece of his that I read, I don't think the author whose blog I cite above is a heretic. 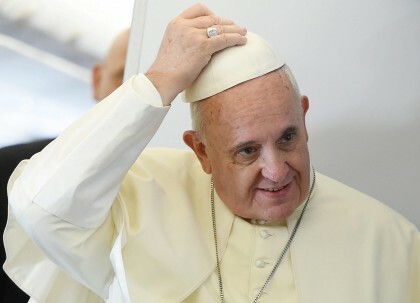 Like many, he probably sees some distorted, Pharisaical, legalism that has enveloped parts of the Church - and he sees pope Francis as the remedy. He's just fine to think so. But the bad stuff he's worried about is not religion; it's something else. He is wrong to propose that religion may be worth ending. Religion is actually very good. In it, we are saved.